This picture is from Dirk Ellerd, a 2006 member of the Cavaliers. My name is Dirk, and I played bass drum four for the Cavaliers in 2006. This picture was taken at the DCI World Championship finals night after our victory performance, and it is probably my favorite and most treasured. All four of us attended Haltom High School in Haltom City, Texas, and we also marched together in the Metro-Alliance Winter Ensemble. We all finally achieved our greatest goal by marching together with the 2006 World Champion Cavaliers. My journey with these guys has been nothing short of spectacular and they made my summer absolutely incredible. Thank you guys so much! 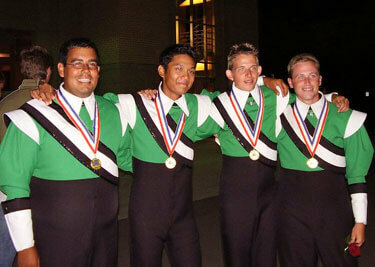 Pictured left to right: Adrian Castillo, Manoel Manikhouth, Kyle Voss and Dirk Ellerd.